A quick Google search confirms that brass, and its gold-tone cousins, has returned to interior design. 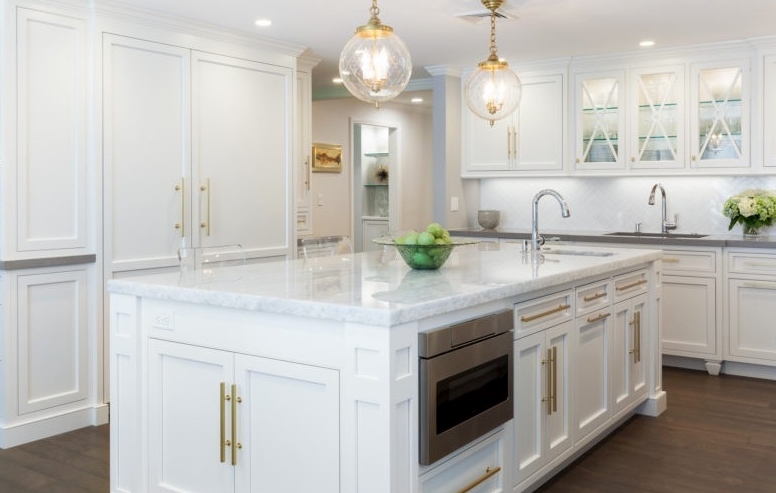 Websites ranging from Better Homes and Gardens to HGTV, Houzz and even the Huffington Post have heralded the resurgence of the golden-hued metals, especially in kitchens. While the old adage of “everything comes back into style” may spring to mind, the latest iteration of brass is not remotely similar to the polished look that was so badly overused in the 1980s. 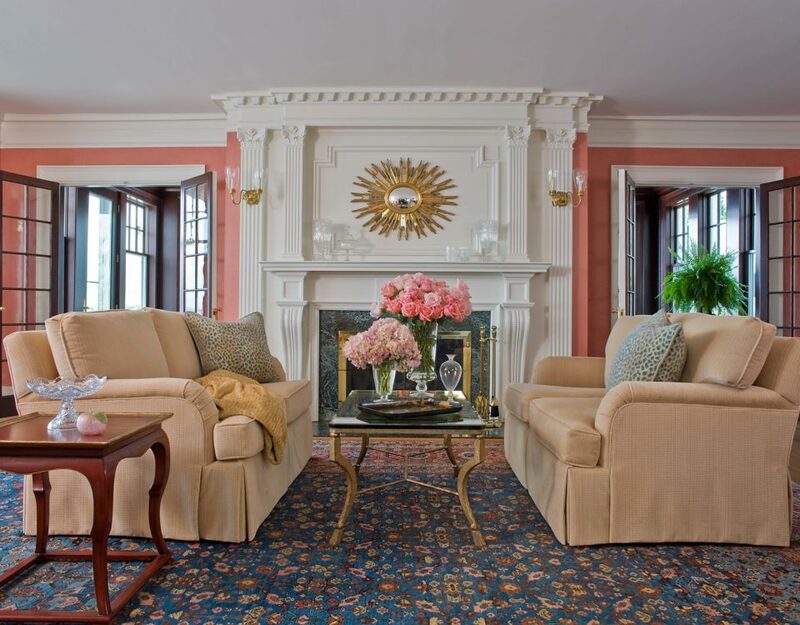 That more-is-more approach has been replaced with a far subtler use of gold-tone metals. Rather than layer upon layer of shiny brass, designers are far more judicious with its use, inserting a piece here and there, more often than not in a soft, brushed finish. In this contemporary kitchen, designed by Plain & Fancy Custom Cabinetry, Jonathan Adler 30-light brass ceiling fixtures and stools with brass frames take center stage. When paired with cool, gray cabinetry and Bernini Bianco polished 18×18-inch floor tiles, the overall effect is one of balance. 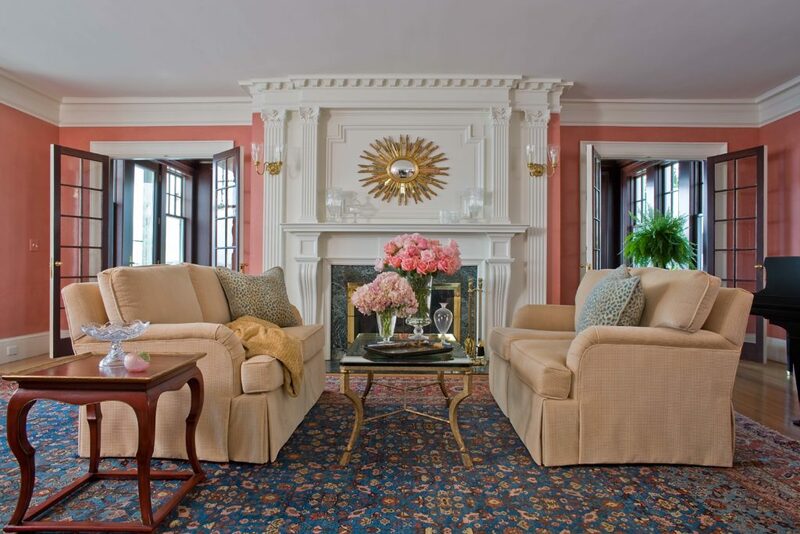 The brass adds visual interest without overwhelming the space. The matte, brushed finished of the cabinet pulls, light fixtures and stools create a subtle contrast to the glossy finish of the flooring. In this transitional kitchen, designed by Roomscapes Cabinetry & Design Center, oversized brass chandeliers visually anchor both ends of the center island. While additional touches of brass have been sprinkled throughout the room in the cabinet pulls, wall sconces and sink fixtures, the white cabinetry and countertops, and the warm wood tones are the predominant colors. Once again, this creates a sense of carefully considered balance. Adding elongated gold-tone cabinet pulls and a pair of brushed brass ceiling lights brings an unexpected pop of color to this nearly all-white kitchen. Designer Jennifer Stuart, of Metropolitan Cabinets & Countertops, opted for polished stainless-steel sink fixtures, which beautifully complement the appliances. In this kitchen, from Supply New England’s Kitchen & Bath Gallery, the designer’s “mixed metals” approach encourages the eye to explore the room, taking in the entire space. Oil-rubbed bronze cabinet pulls, from the Edgewater line by Top Knobs, are at the darker end of the metallic color spectrum, while the weighty light fixtures are a mid-tone. The stainless appliances, the nail-head finish and the footrests on the stools bring in the pale tone. When used with a deft touch, today’s brass is not remotely like the brash golds that were so prevalent – and so quickly discarded – in the time of oversized shoulder pads and big hair. It feels fresh and fun. It feels like it’s here to stay. © 2018 Seven Tide Boston. All Rights Reserved.